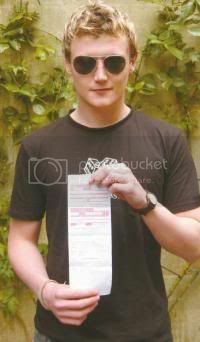 Former Balliol student Sam Brown with his penalty notice earlier this year. An ex-Balliol student fined by police for calling a horse 'gay' has been summoned to Oxford magistrates court after refusing to pay his fine. Sam Brown, who graduated last summer, was arrested in May this year after a drunken conversation with a pair of mounted policemen on Cornmarket Street. He will appear before magistrates on 16th December. As reported in The Oxford Student last term, Brown had just left the Cellar Bar when he allegedly called out to the policemen “Mate, you know your horse is gay, I hope you don’t have a problem with that.” Warned by one officer not to repeat his comment, Brown reassured him that he was not insulting both horses, and said: “No, don’t worry. Your horse is fine, it’s his horse, his horse is gay.” He then proceeded to follow the policemen down the street, repeating his comments. “Sam was adamant his equine gaydar was accurate,” eyewitness Daniel Cooper told The Oxford Student at the time. However, the officers considered the comments to be a breach of the Public Order Act, and took him into custody, calling on two squad cars and six policemen to make the arrest. Among those present was ex-Balliol LGB Officer, Matthew Williams. “Aside from the hilariousness of the event there’s a serious question here,” he commented at the time. “Isn’t it offensive to assume categorically the word ‘gay’ is insulting? I kept drunkenly shouting at the police that I was offended that they assumed ‘gay’ was being used as an insult.” Brown was released the following morning and issued with an £80 fine for, “causing harassment, alarm or distress.” After discussing the matter with his college solicitor Brown decided not to pay the fine, stating he would rather have the case heard in court. “I thought I was calling their bluff - the solicitor told me it would be unlikely to go any further, and I didn’t feel there was much of a case against me.” On a visit to Oxford five months later, Brown was surprised to be handed a bundle of post, including a court summons. The summons stated that he was charged with “using threatening, abusive or insulting behaviour within the hearing of a person likely to be caused distress. ?? He is planning to plead not guilty to the charge, and is considering mounting his own defence. “I think it’s a fairly cut and dry case really. It’s just irritating because I’m starting a new job in London on Monday, and I’m going to have to take a day off to go to court as soon as I’ve finished my training week.” Dan Cooper told The Oxford Student he still considers the arrest a “massive overreaction on the part of the police”.